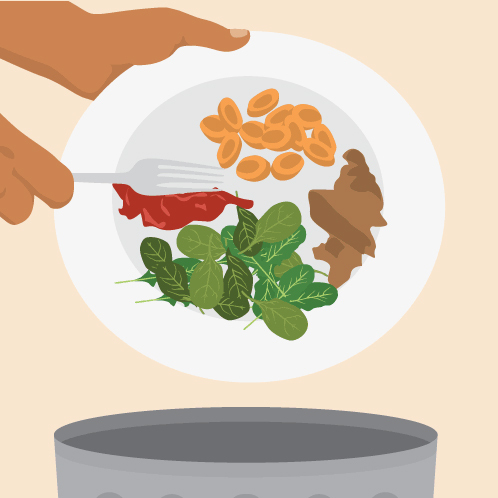 You might not think twice about throwing away spoiled milk, cheese coated in fuzz, or uneaten leftovers, but the impact of food waste is enormous. In the United States, 31 percent of the food grown and raised – the equivalent of 133 billion pounds of food per year with a retail value in excess of $161 trillion, according to the USDA – is never eaten. Translation: Almost one-third of all of the bacon, tomatoes, apples, pasta, chicken, rice, and other foods you purchase is tossed into the trash. According to the book American Wasteland: How America Throws Away Nearly Half of Its Food (and What We Can Do About It), the average American family spends approximately $2,220 per year on food that is never eaten. Food waste isn’t just an economic issue. Wasting food also takes its toll on the environment. 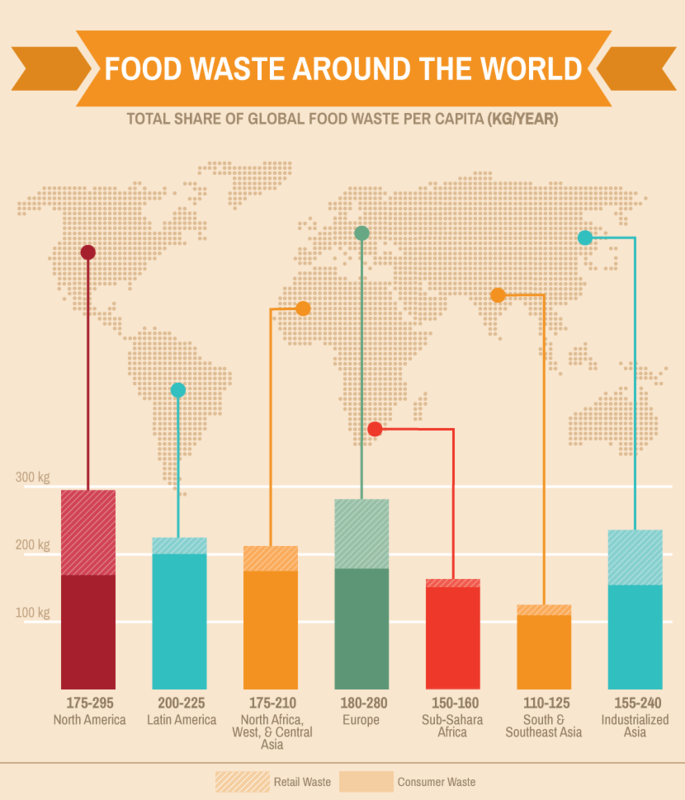 It takes a considerable number of resources to produce the food we’re throwing away. In fact, getting food from farm to table accounts for 10 percent of the total US energy budget, uses 50 percent of US land, and accounts for 80 percent of national freshwater consumption – not to mention all the fertilizers and pesticides used to produce conventional (non-organic) foods. The USDA notes that most wasted food is sent directly to the landfill where it is a major producer of methane, a potent greenhouse gas that contributes to climate change. Food waste occurs at all stages of production, from farms and food processing facilities to supermarkets and restaurants. And, of course, it happens in your home. Learn how you can take action to reduce your impact. Shop smart: Create a meal plan for the week and make a shopping list – then stick to it at the store. Impulse purchases often lead to food waste! Check the refrigerator before going shopping to keep from purchasing duplicate items. During meal planning, remember that some recipes will make enough food for multiple meals. Planning to eat leftovers (from meals cooked at home or ordered in restaurants) will help cut down on over-purchasing at the supermarket and keep leftovers from being wasted. Buy imperfect foods: Farmers often struggle to sell odd-shaped, undersized, or blemished produce, sending edible food straight to the landfill. The “ugly food” movement is gaining momentum, educating consumers about the importance of embracing less-than-perfect produce – which tastes just as delicious as picture perfect fruits and vegetables do – to keep it from being wasted. At the farmer’s market and the supermarket, let farmers and produce managers know that you’re happy to buy crooked carrots. Rethink expiration dates: It’s tempting to toss foods when their “best before” dates have passed. Despite their name, expiration labels are not meant to tell consumers when food is bad. Instead, manufacturers use these dates to indicate the quality of the food may degrade after the date. Give foods the “sniff test” to test for spoilage, or take a small bite; if a food smells or tastes bad, toss it. Remember, foods from crackers and canned soup to condiments and chocolate milk are often safe to eat even if their expiration dates have passed. Your freezer is another essential tool for preserving foods. A package of chicken breasts, a pound of ground beef, and fish filets will last longer in the freezer than in the refrigerator. Consider buying frozen fruits and vegetables; you can cook a portion and save the rest in the freezer where they will keep for months. Leftovers can also be frozen and reheated for additional meals. Embrace technology: There are several smartphone apps aimed to help reduce food waste, including the FoodKeeper app developed by Cornell University and the USDA. The free app offers a searchable database of more than 500 foods along with cooking and storage tips for foods ranging from apricot jam to zucchini. FoodKeeper even synchs to a 24-hour virtual hotline staffed by USDA experts who can answer with food storage questions. Vote with your wallet: As awareness of food waste grows, more supermarkets are taking action, rethinking their ordering procedures and storage practices or donating foods to nonprofit/hunger relief agencies. Ask your grocers what steps they’re taking to reduce waste, and shop at supermarkets that are committed to keeping food out of landfills. Compost: Composting food scraps does not cut down on food waste, but it does keep coffee grounds, banana peels, apple cores, and other inedible foods from going to the landfill and adding to greenhouse gas emissions. Compost is also a nutrient-rich soil amendment that can help your vegetable garden thrive! By knowing your impact, and following these smart steps, you can do your part in the shift towards greater efficiency in our food systems.